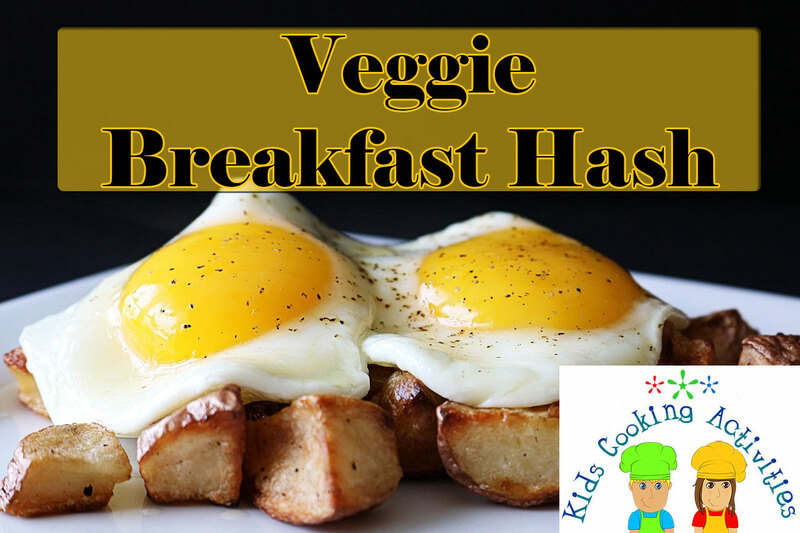 Some people call it hash, others call it a skillet meal, but no matter what you call it, you know it's downright delicious. Start by taking seasonal potatoes, scrub them or peel them, and cook them in a big pot of salted water just until knife tender. Drain the pot and let them cool, then dice them. Get your big skillet out, throw in some oil or butter or bacon and start frying. Add your potatoes in the skillet, then start adding whatever you want and cook until potatoes are browned and the rest of the veggies are tender. You can top the skillet meal with some cheese, chili beans, shredded cooked meat, or even an egg or two. Whatever you add to the skillet, you've got a base built on farm freshness that is bound to please. This recipe delivers such a gorgeous display of color with its rich oranges, deep purples, and gorgeous greens. But once you take a bite, you’ll realize its beauty runs more than skin deep. Roasting the lightly seasoned vegetables brings out the full depth of their flavor to infuse every bite with a rich, savory sweetness that makes this one a true winner. If necessary, use two half baking sheets or a larger three-quarter size sheet pans to allow enough room to spread the vegetables out in a single layer without overcrowding. This will allow them to roast evenly without steaming. Tip: For best results, crack each egg into a small bowl before transferring onto the sheet pan. Repeat this process, one egg at a time, until all eggs are on the pan. 1. Preheat oven to 425°F and line a large, rimmed baking sheet with parchment paper or a Silpat® baking mat. If using parchment paper, lightly spray with non-stick cooking spray. Set aside. 2. In a large mixing bowl, toss sweet potatoes, purple potatoes, Brussels sprouts, red onion, garlic, onion powder, and olive oil until vegetables are well coated. Season with salt and black pepper, to taste. 3. 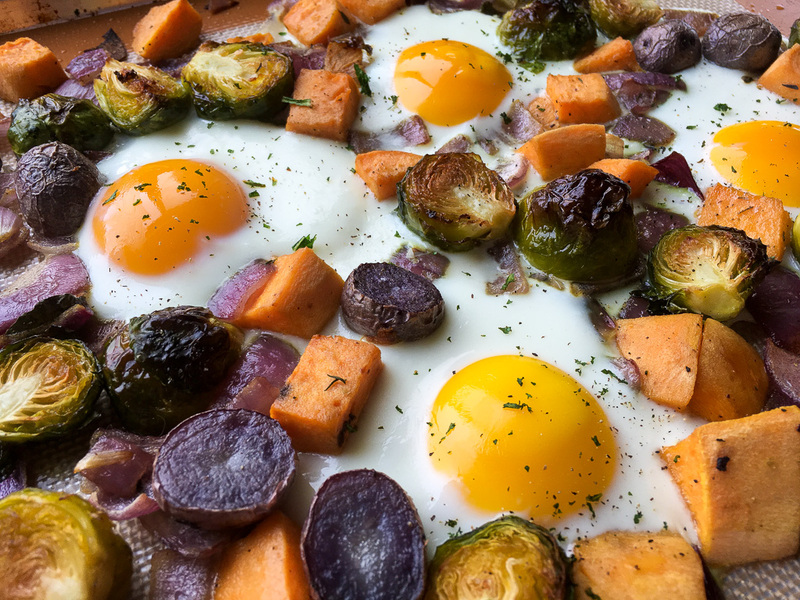 Spread the sweet potato mixture onto the prepared sheet pan in a single layer without overcrowding and roast in pre-heated oven for 8-10 minutes. Stir vegetables and continue roasting another 8-10 minutes, or until sweet potatoes are fork tender. 4. Remove sheet pan from oven and create 6 round, evenly spaced openings among the vegetables. Carefully pour an egg into each opening, keeping the yolk intact. Season with additional salt and pepper, if desired, and return pan to the oven. 5. Bake for 6-8 minutes, or until the egg whites are set and the yolks reach the desired level of doneness. Remove sheet pan from oven and garnish with crushed kale chips or dried herbs of choice, if desired, and serve immediately with the roasted vegetables. Enjoy!